Welcome to the tazti website! 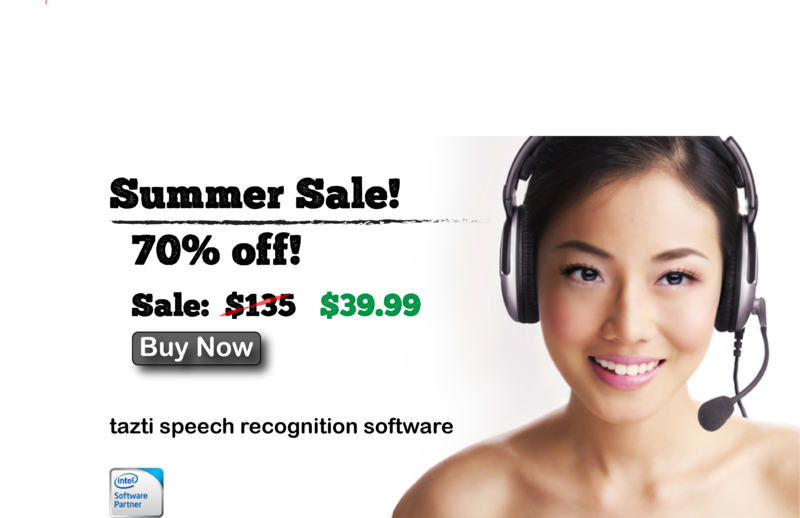 tazti is state of the art Speech Recognition & Voice Recognition software. You can easily mash up tazti to files, folders, programs, videos and songs on your PC, to open them by voice control. Play PC Games, control applications, programs, and robots by voice command! Over 300,000 people have now tried tazti and it's many features. tazti is super fun, especially if you are tired of pounding your keyboard or want an easy to use assistive technology. Great as well for people with Arthritis, Carpal Tunnel, Tendonitis, Fibromyalgia or other hand, finger or wrist pain. Purchase tazti now, only $80 $19.99 -- a savings of 75%! Navigate to websites and directories, open files, and run programs with your voice. tazti comes with over 25 built in speech commands to do basic things like closing a window, opening calculator etc. Add more speech commands, up to a total of 300. Edit or delete any speech command - built in or your own. You choose your own trigger words for your speech commands. You decide what speech commands do. Download pre-built speech command profiles to use with your favorite games and programs. Create and customize your own speech command profiles for your favorite games and programs. tazti works with Windows 7, Windows 8, Windows 8.1 and Windows 10. Many users have created and shared their own game and application profiles to the tazti sharing website. You can download those profiles and try them within tazti with the games they were created for. You can also create your own game and application profiles. And you can share your profiles to our sharing website so your friends and others can download them! You can have multiple profiles for each game or application if you want them to have different groups of speech commands. Do you want to use tazti with a language other than English? The new, multi-language, version of tazti is for you. Coming soon! Click here to sign up to learn more about it and to be notified when it is released! Now you can use tazti to control and play most PC video games as well as many browser based games, by talking to your PC. For each game you can set up a profile of all its keyboard commands as speech commands through keybinding. Or your profile can have only a few speech commands for a game. You speak the speech command and your character in game responds as if you've pressed that hard to reach keyboard key! You can use your various keyboard commands and speech commands at the same time! Play WOW, COD, Eve and many other games by talking to your PC! If you have Arthritis, Carpal Tunnel, Tendonitis, Fibromyalgia or other hand, wrist or finger issue that is causing you to avoid using your keyboard, tazti can help you eliminate hundreds of of thousands of keyboard and mouse clicks a year saving wear and tear on your hands, wrists and fingers. It's easy for you to program tazti with your favorite websites, files, folders, applications and programs by associating them to speech commands. Then just speak the speech command and presto... tazti will open the websites, files, folders, applications and programs associated to the spoken speech command. Many people have many files, folders or programs on their PC that they are regularly opening. With tazti you can now create your own custom speech commands and associate them to a file, folder, or program on your PC. A user might visit the same 30 websites regularly. With tazti you can now create your own custom speech commands and associate them to a particular webpage. You can open a file, folder, program or webpage immediately by talking to your PC via tazti voice recognition software. Admit it. At one time or another we all talk to or at our PC. Now you can control applications and websites by your voice by using command line parameters and query strings in tazti. This lets you mashup tazti to almost any application similar to how autohotkey works, but the keybinding is to tazti speech recognition. PC based robotics, robots and macro programs can be controlled with tazti by using batch files. Some implemented examples of robotics integrations can be found on Youtube. Just look up tazti.